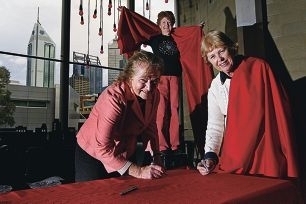 Art Gallery of WA volunteers Leonie Garnett, Kate Kirwan and Stephanie Watson sign the ribbon. Gallery volunteers were some of the first to put their mark on the ribbon, which was launched as part of Volunteer Week. The ribbon will travel throughout WA before it is wrapped around Government House for International Volunteer Day on December 5. Seniors and Volunteering Minister Tony Simpson said the project aimed to recognise volunteers throughout the state. To track the ribbon, go to volunteeringwa.org.au.